Is that ultra-cool plaque just too much to hang your sword on? Looking for something to showcase the beauty of your sword, rather than steal its thunder by looking as cool, if not cooler? Then the Universal Wall Plaque is right for you. 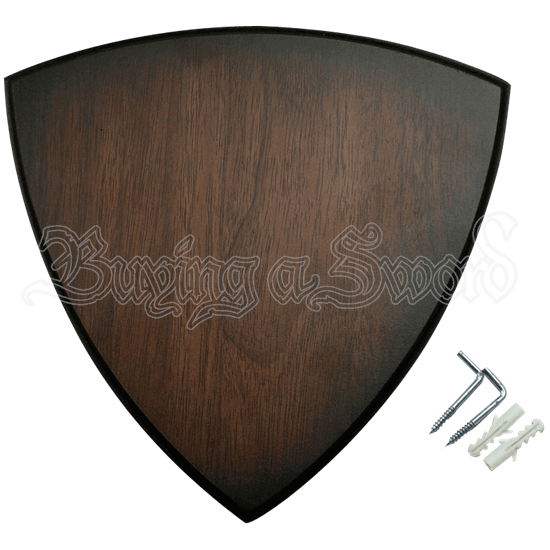 The backdrop of simple, yet attractive wood-grain makes the perfect statement when combined with a sword or any other hanger that will fit its hangers, for that matter. Unadorned and simple, this Universal Wall Plaque will perfectly showcase any suitable weapon, all without taking away from the design and elegance of the weapon displayed. Post Width: Variable, based on guide marks on back. Posts at most narrow are 2.5 Inches apart. Posts at widest are 5.25 Inches apart.